FCFA is training African scientists in new skills and methodologies to study the African climate. Siny Ndoye participated in a week-long workshop on climate modelling at the University of Leeds, organised by the Africa Monsoon Multidisciplinary Analysis 2050 (AMMA-2050) project in December 2016. Dr Ndoye has an intellectual passion: it’s to gain a better understanding of how the oceans and atmosphere interact to influence west Africa’s climate. Propelled by his recently-earned PhD in physical oceanography, Dr Ndoye looks forward to exploring these interactions as part of FCFA’s Africa Monsoon Multidisciplinary Analysis 2050 (AMMA-2050) project. That’s why he jumped at the opportunity to visit the University of Leeds in December 2016 to exchange knowledge with other African scientists and to learn new climate modelling skills. Dr Ndoye’s home country of Senegal is on the edge of a continental shelf which – according to the World Bank – “benefits from a strong upwelling current…that supports some of the richest fishing grounds in the world”. However, as climate change grips the region, it affects the marine environment, with knock-on effects for the nutrition and livelihoods of Senegal’s millions of coastal-dwelling people. “It is very important for us to understand the climate variability in Senegal, particularly in the coastal region,” said Dr Ndoye. “We need to study these processes so that we can provide information to fishermen and they can adapt their methods.” The impacts on marine ecosystems are already evident, he added: for example, the location of fish spawning grounds is moving. Sea level rise also has a detrimental effect on people living in west Africa’s coastal zone: coastal erosion is an increasingly stubborn problem. “We want to evaluate sea level rise as part of AMMA-2050 project, to see if we can predict the degree of sea level rise and develop an indicator for its human impact,” Dr Ndoye said. What’s more, he added, ocean dynamics are a “big factor” in influencing climatic changes on the land. 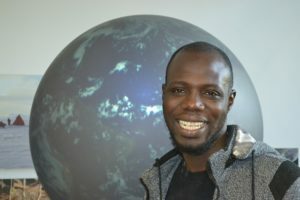 Dr Ndoye will focus his research on modelling the impacts of climate change on west Africa’s marine and coastal environments, while one of his AMMA-2050 colleagues will focus on modelling the land-based impacts of climate change on agriculture and other key sectors. Involvement in FCFA has provided Dr Ndoye with opportunities to broaden his scientific horizons. At the training course at the University of Leeds in December 2016, he is learning Python, a computer coding language which is versatile and effective across several modelling platforms. “It’s very important to be here to learn and to understand different methods I can use and to understand the different configuration and different simulation [approaches],” he said. Involvement in FCFA’s West Africa project – AMMA-2050 – has also given Dr Ndoye access to the multi model CMIP5 database, which can enable him to run further simulations of the West African climate. Generating many different model results provides a more comprehensive picture of how climate trends could develop in the years ahead. When he returns home, Dr Ndoye looks forward to sharing his new knowledge and skills not only with fellow oceanographers and meteorologists in his home institution, the University of Dakar, but also with the biologists and ecologists with whom he works frequently to understand Senegal’s marine and coastal environment. Image: Siny Ndoye, courtesy Mairi Dupar, FCFA.